How Much Trouble Is Ted Cruz Really In? Sen. Ted Cruz, Republican of Texas. A new Texas Senate poll came out this week showing Democratic Rep. Beto O’Rourke within 1 point of Republican Sen. Ted Cruz. It gave new life to a familiar question: Could Texas finally flip blue? Normally, this would be the point where we lecture everyone about the dangers of putting too much stock in one poll. But this poll wasn’t even much of an outlier — it came on the heels of a few others that also show O’Rourke within a few points of Cruz. That’s an awfully close race for a state that President Trump won by 9 points in 2016. Is it time to start betting on a Democrat in Texas? We still say you should hold onto your chips. OK, first the new survey: Emerson College’s1 poll of registered voters, conducted online and through robo-calls, reported 38 percent support for Cruz and 37 percent for O’Rourke, well within the poll’s 4-point margin of error. About a fifth of respondents remained undecided. But how much significance should we really give to a few polls this far out from Election Day? FiveThirtyEight will publish a Senate forecast soon that will give you a more comprehensive answer, but in the meantime, let’s just look at how closely Senate polls conducted in the late summer have matched the eventual election results. The August polling averages were off by between 5 points and 14 points in any given year. On average since 1990, they were off by about 8 points. Of course, that error could cut either way — it doesn’t necessarily favor Cruz. The senator leads by 3 points, on average, in polls taken this month. If this year’s polls are off by that average amount — about 8 points — then we really shouldn’t be surprised by anything from Cruz winning by 11 points to O’Rourke winning by 5. And even that understates how wide the range of possible outcomes still is — that’s just what could happen if the polls are off by the average amount. Who’s to say polls won’t be off by 14 points like they were in 1990 and 1994? None of this is to say O’Rourke has no chance. Expert ratings, such as those provided by the Cook Political Report, Inside Elections and Sabato’s Crystal Ball, have a track record of accuracy in forecasting elections, and all three have pinned the race as either “lean Republican” or “likely Republican,” meaning Cruz is favored but they believe O’Rourke has a shot to at least make the race competitive. Moreover, O’Rourke, a three-term congressman, has pulled far ahead of Cruz in the fundraising race. According to the Texas Tribune’s analysis of Federal Election Commission data, Cruz raised $15.6 million from the start of 2017 through July; O’Rourke pulled in a whopping $23.6 million. That sum makes O’Rourke’s campaign the third-biggest fundraiser among all Senate candidates this election cycle, according to OpenSecrets, a nonpartisan research group that traces money in politics. O’Rourke also has the potential to gain ground by improving his name recognition in the next two months. The Emerson poll found both candidates with similar favorability ratings, but 38 percent of Texans either felt neutral toward O’Rourke or said they had not heard of him, compared to only 19 percent who said the same about Cruz. In a national environment where the generic ballot favors Democrats and Congress’s approval ratings remain low, incumbency may not be as much of an advantage for Republicans as it has been in some other years. This suggests that as O’Rourke becomes more familiar to voters in the next couple of months, he may have more potential to win over undecided voters than Cruz does. Still, not a single poll so far has shown O’Rourke ahead of Cruz. So don’t make any serious bets just yet — it’s still too early to get carried away with speculating about big changes in Texas based on August polling alone. 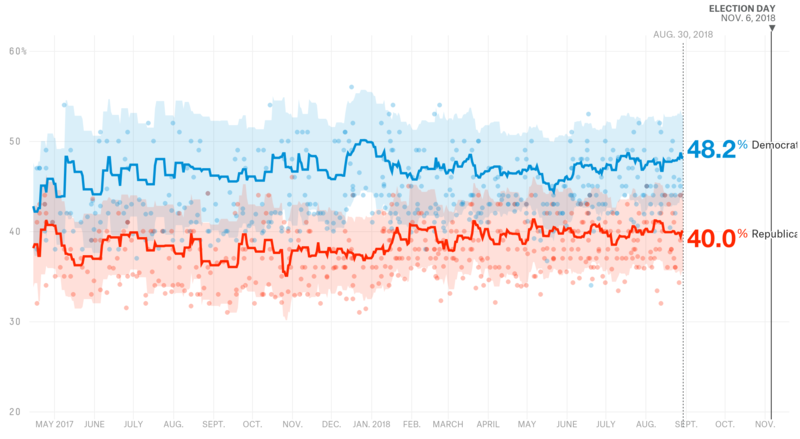 UPDATE (Aug. 31, 4:00 p.m.): We noticed that some FiveThirtyEight readers were discussing in the comments section that our approach of showing the average error of polls tells you only that the average August poll is about 8 points off historically. But how about the average of all August polls in a particular race — has that more accurately predicted the election? Since you asked, we calculated the average of polls for each individual race, then filtered out any race that didn’t have at least three polls (as this Texas race does). We found that the average of polls in each race was also off by approximately 8 points. If you’d like to dive in further, we’ve also published the data behind this article, you can check it out on our data page or grab it from GitHub. In Wisconsin, a Suffolk University poll found Gov. Scott Walker, a Republican, 2 points behind Democratic challenger Tony Evers. Several polls this summer have indicated that Walker may be in danger of losing the governorship. A YouGov poll conducted after U.S. Sen. John McCain’s death on Saturday found that he still had better favorability ratings among Democrats than among Republicans. Seventy-five percent of Democrats and 52 percent of Republicans said they had a favorable opinion of the late Republican senator from Arizona. A C-SPAN/PSB poll found that 35 percent of likely voters can name President Trump’s Supreme Court nominee, Brett Kavanaugh, when asked in an open-ended question. Relatedly, an AP-NORC poll found that a plurality of Americans don’t have strong feelings about Kavanaugh as a nominee one way or the other. According to an Axios/SurveyMonkey poll, nearly two-thirds of Americans believe former Trump lawyer Michael Cohen was telling the truth when he said Trump had given him orders to pay off two women who have said they had affairs with the president. Just over half of voters said they disagreed with the statement that Trump “has been honest and truthful when it comes to the investigation into Russian interference with the 2016 presidential election,” according to an NBC News/Wall Street Journal poll. Meanwhile, a Suffolk/USA Today poll finds that 63 percent of Americans think Trump should voluntarily agree to be interviewed by special counsel Robert Mueller. 58 percent of Americans favor a pathway to citizenship for immigrants who are currently living illegally in the U.S., while 32 percent oppose it, according to a Fox News poll. That’s down from 65 percent who favored it in February. A HuffPost/YouGov poll asked 1,000 Americans what happened on Aug. 21 — the day former Trump campaign chairman Paul Manafort was convicted on federal charges and Cohen pleaded guilty to charges of his own — and found that Americans are really not that plugged into major national news. A literal straw-poll by Ipsos for BuzzFeed News found that 48 percent of adults support local government bans on the use of plastic straws, while 42 percent oppose them. Still, 3 in 4 respondents support businesses choosing to provide plastic straws to customers only upon request. Americans are divided in how they feel toward Mexico, but two-thirds report having warm feelings toward Canada, according to Pew Research Center. Trump’s net approval rating currently sits at -12 points, according to our tracker. (That’s a 41.5 percent approval rating and a 53.5 disapproval rating.) One week ago, his net approval was -10.9 points; 42.1 percent of Americans approved of Trump’s job performance and 53 percent disapproved. 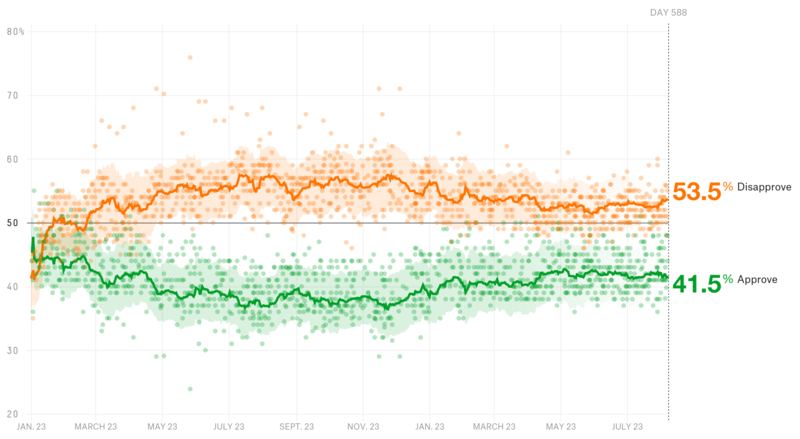 At this time last month, that net approval was -11.7 points — 41.3 percent approval, 53 percent disapproval. Per our tracker of generic ballot polls, Americans currently opt for a hypothetical Democratic House candidate over a hypothetical Republican by a 8.2-point margin (48.2 percent to 40 percent). One week ago, their lead was a similar 7.8 points (47.8 percent to 40 percent). At this time last month, our tracker sat at Democrats 46.8 percent and Republicans 39.6 percent, or a 7.2-point Democratic advantage. Check out our 2018 House forecast and all the polls we’ve been collecting ahead of the midterms. Emerson College was given a B+ in FiveThirtyEight’s latest pollster ratings, based on an analysis of the accuracy of 85 of their polls in elections over the past several years. We weeded out any polls of races that didn’t have at least one Democrat and one Republican facing off. We took the absolute value of the difference because we’re only interested in the size of the polling miss, not which direction it missed in.